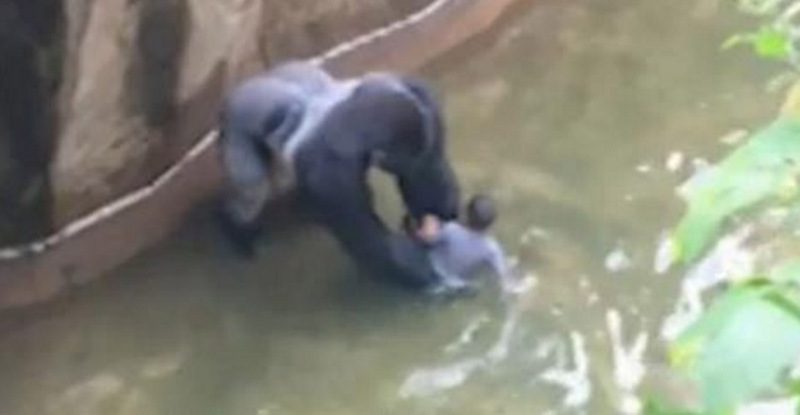 Zookeepers had to shoot an endangered gorilla after a 4-year old fell into it’s compound. According to the reports from The Mirror, a gorilla named Harambe – at Cincinnati Zoo had to be shot dead after a 4-year old boy fell 12-feet into the gorilla’s pit. A horrifying video shows how the gorilla hauling the child for 10 minutes before the officials could think of a way to deal with the situation. The boy was admitted to Cincinnati Children’s Hospital Medical Centre for treatment after rescuing from the gorilla and has not sustained any serious injuries. THEY MADE A TOUGH CHOICE AND THEY MADE THE RIGHT CHOICE BECAUSE THEY SAVED THAT LITTLE BOY’S LIFE. IT COULD HAVE BEEN VERY BAD. “I DON’T KNOW IF THE SCREAMING DID IT OR TOO MANY PEOPLE HANGING ON THE EDGE, IF HE THOUGHT WE WERE COMING IN, BUT THEN HE PULLED THE BOY DOWN AWAY FURTHER FROM THE BIG GROUP. Mr. Maynard also expressed his distress about the incident and said that his team had been forced to kill their animal in such an emergency.